Malaria is a tropical disease spread by mosquitoes, which can cause fever, headache and, in severe cases, coma or death. The risk of contracting Malaria in affected areas is significant. 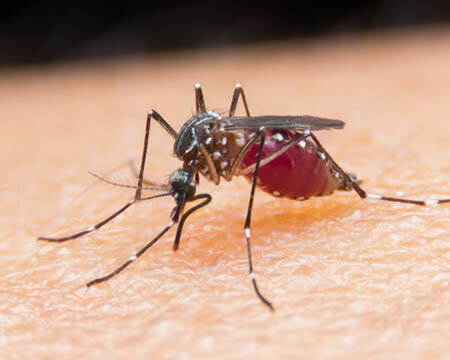 Approximately 1,500 travellers return to the UK with Malaria every year. In 2015, there were 1,400 cases of Malaria reported among UK travellers which included six deaths. Which countries are at greater risk? Malaria is one of the biggest global threats and is usually found in tropical and subtropical climatic regions. The World Health Organisation estimates that there were 243 million cases and nearly 1 million deaths from Malaria in 2008. It is recommended to take extra precautions if you are planning to visit Sub-Saharan Africa or South America. Other areas that are at high risk of malaria are some South East Asian countries. Countries in Asia and Latin America are considered at moderate risk, but nevertheless precautions should be taken. Do you have a trip scheduled to a country where Malaria is at a high risk? Visit Herbert & Shrive Pharmacy today for anti-malaria vaccination near Twickenham for a safe journey ahead. Anti-malarial vaccination is easily available with a valid prescription. We can provide you with antimalarial vaccination during your consultation without charging a fee for writing a prescription. What are the safety measures to consider before a trip? Learning well about the disease is essential. Update yourself regarding Malaria, its symptoms and critical health risks involved in it. Choose clothes that cover most of the body and have been treated with an insect repellent. Diagnosis at the earliest hour is the most important factor in saving lives. Prompt and accurate diagnosis of malaria is mandatory for both quick and efficient disease management and malaria surveillance. A high-quality disease diagnosis is important in every circumstance as the wrong diagnosis can lead to significant mortality. WHO recommends prompt malaria diagnosis either by microscopy or malaria rapid diagnostic test (RDT) in all patients with suspected malaria before treatment is administered. According to a recent fact, worldwide, there were an estimated 198 million cases of malaria in 2013 and 584,000 deaths. The symptoms of malaria vary between mild to severe. Mild symptoms include a sensation of cold, shivering, fever, headaches, vomiting and sweats followed by a return to normal temperature, with fatigue. Severe ones include multiple convulsions, breathing and respiratory distress, abnormal bleeding and signs of anaemia or jaundice and evidence of vital organ dysfunction. Find the best Malaria prevention service at your nearest Herbert & Shrive pharmacy.